It’s a $12 billion issue in the United States each year. Drive around pretty much any large urban area and you’ll see it -- graffiti. But Law Enforcement Associates Corp. is hoping to curb the problem with its Graffiti Cam, which proactively notifies law enforcement of graffiti-related activity. Introduced at ASIS last week in Las Vegas, the Graffiti Cam is anchored by a high-resolution camera located in an all-weather enclosure. When the unit is activated due to graffiti-related motion, the camera sends text messages to designated cell phones and e-mails JPEG photos to specific addresses, allowing law enforcement to dispatch personnel to the scene. And since the unit is covertly disguised in housing, criminals are less likely to notice they are being recorded, helping law enforcement score more arrests. The camera, which has a range from two feet to more than a quarter-mile, can capture up to 6,000 high-quality images at 0.1 seconds per frame to aid in the identification and conviction. The Graffiti Cam also is mobile, allowing law enforcement to move the unit to specific problem areas. In addition to crimes of graffiti, the unit can be used to monitor for drug-and gang-related activity, vandalism and theft. The product has already drawn interest from major cities like Denver, which spends more than $1 million per year on graffiti cleanup. 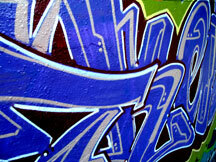 The city has created a Graffiti Task Force with the goal of eliminating the problem by 2010. The task force, which includes the Department of Safety and Denver Police Department, plans to employ eight Graffiti Cams across the city. “We’re eagerly anticipating using the product to help us catch criminals in the act and hold them accountable for their crimes through strict penalties on restitution and community service,” said Denver Police Commander Doug Stephens.